If you haven’t yet discovered Charity: Water, you should check them out right now, visit RobertSkrob.com/CharityWater and watch the video. By bringing people clean, healthy water, they are preventing hundreds of other problems, enabling children to get an education and helping people build an economy. It’s an organization that’s changing lives in an important way. Beyond that, Charity: Water has been successful in reaching a donor segment that’s previously ignored charities — young people. The average age of a Charity: Water donor is decades younger than most organizations. These donors have made Charity: Water the single largest water charity in the United States today, even though the organization launched just 10 years ago. 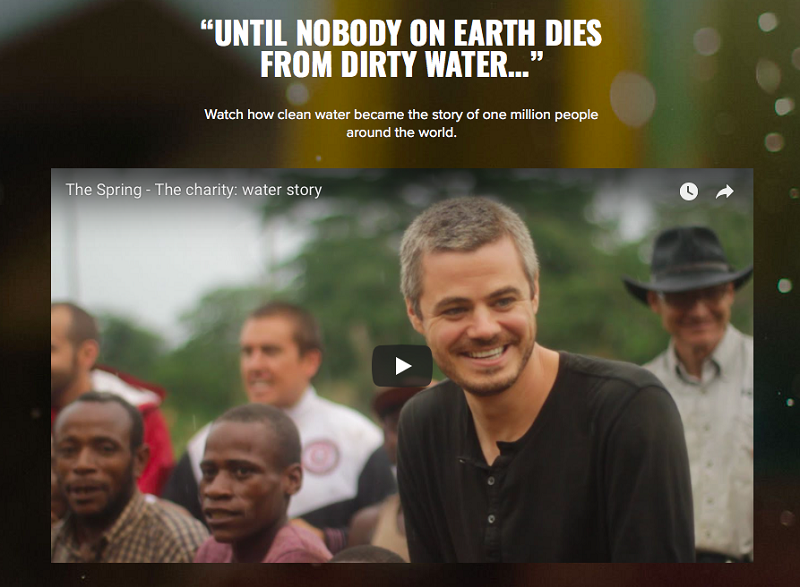 In the last few months, Charity: Water has launched their new membership program called The Spring. This is an opportunity to turn one-time donors into members who give monthly. Rather than feeling great about supporting efforts to provide clean water once, you can have that feeling each month. The Charity: Water team engaged me to help them design a member experience that members would continue to enjoy for many years. There were a lot of questions about what to deliver, how often, and how to ensure the experience for members is consistent to the Charity: Water brand promise. An essential part of Charity: Water’s mission is that 100 percent of your contributions go toward water projects. If they begin to deliver too much to members of The Spring, members will begin to wonder why those resources aren’t going toward clean water. Sure, who wouldn’t love to have a Charity: Water bottle or hoodie? But, if getting that hoodie came at the expense of some young girl getting clean water, let’s get the girl her water. The Charity: Water team has innovated some of the most remarkable fundraising campaigns in the charity world. Their donate-your-birthday campaign was new and revolutionary. It was pure magic. When they launched The Spring, the membership concept was new. Suddenly, rather than promoting campaigns, they were engaged in a long-term relationship with their members. They suddenly needed some standard membership systems to become member retention builders. With Charity: Water, my first task was to create a checklist of the messages that must be within every member communication. I reviewed their new member acquisition campaigns that are generating the best results. I created a list of each of the key messages within each campaign and compared the lists for similarities. In the end, I identified six key emotional drivers the Charity: Water team can use to maintain the feeling members have when they first join The Spring. It’s a list they can refer to for onboarding, monthly emails, and any content they create for members. It’s focused on the feelings that got members to join The Spring to begin with and what will keep them excited about the people the charity serves. As is common, the Charity: Water team had already put a lot of work and effort into their new member welcome email. Even so, there were several opportunities to improve it to increase the excitement members feel after they join. These included outlining a new member welcome video. If many of our new members are joining because they watched a video, let’s share a video with them after they join to maintain that excitement. We also designed a series of videos and communications, including one that gives the new donor a look into the process of turning donations into water projects. As I learned, creating wells in foreign countries halfway around the world is a complicated endeavor. It’s good to give members an inside peak into what it takes to bring the world clean water. Another key system we designed is the member save sequence. Although our systems permit members to downgrade their contributions, we didn’t have a process to communicate with members before they canceled to encourage them to give a lesser amount instead. There’s a lot of money in saving members before they quit. One of the biggest opportunities for Charity: Water is to invite individuals who make a one-time contribution to become a member of The Spring. Why do all the work of identifying some brand-new person who has never heard of you to become a member when, instead, we could invite individuals who have made a single donation to become a member? Here’s a question for you: How can your process be improved to transform your one-time customers into members who buy from you on a monthly basis? Membership is a powerful relationship. You give members a sense of belonging, an identity, and a community. Implementing systems that make these feelings stronger is the retention builder secret to increasing engagement, excitement, and long-term recurring revenue.